Yesterday, Manju Kiran and Raghunath Thircovil came to the Chennai ColdFusion User Group for the Adobe ColdFusion and Flash Platform UG Tour. Since it's a one day event we had the sessions on Preview of Adobe Flash Platform, Adobe ColdFusion at morning and hands on session on using Flash Builder and Adobe ColdFusion at afternoon. The event hall is jam-packed with more then 80+ attendees from both the ColdFusion and Flex community from Chennai. Raghu started the Event at 10:30 AM and he talked about the awesome features of Flash Builder 4 and Flash Catalyst with lots of demos. After Raghu presentation, Manju started his session on ColdFusion and Bolt. He walked through the various new features and improvements of upcoming Adobe ColdFusion and continues his session after post lunch because of the tons and tons of questions from attendees. 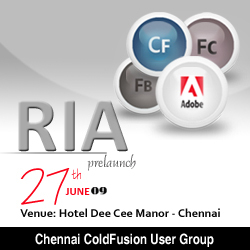 On June 27th Raghunath Thircovil, Adobe Flash Platform Evangelist and Manju Kiran, Sr.Lead Software Engineer Adobe ColdFusion team are coming to Chennai to talk about the Next Version of Adobe ColdFusion code named Centaur, New IDE for ColdFusion code named Bolt and about the latest additions to the Adobe Flash Platform: Adobe Flash Builder and Adobe Flash Catalyst. 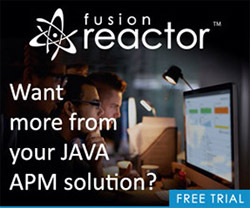 This is a Full day event with ColdFusion and Flash Platform Session followed by Hands-on training on using Flash Builder, Flash Catalyst and ColdFusion. Come learn about the exciting new features and discover how Centaur, Bolt, Flex, and Flash Catalyst will accelerate your application development. There will be a free lunch, refreshments and giveaways so don't miss this event we have only limited seats. Please Register for the Event here. Chennai CFUG May month meeting is on tomorrow and the topic is Flex for Web Developers. In this meeting Shahjahan from RIA Digital Solution is presenting about Adobe Flex framework and how web developers can easily learn Flex and how to start there RIA development using Flex. Check Chennai CFUG on Adobe Groups for more information. Chennai CFUG is having the April month meeting on tomorrow and the topic is CFEclipse 101. In this meeting I'm presenting about using Plug-ins, CF8 Extensions, SnipEx Server and Snippets in CFEclipse for ColdFusion application development. Chennai ColdFusion User Group is having a meeting about using CFEclipse for ColdFusion Application development on coming February 14. In this meeting I'm presenting about using ColdFusion 8 Eclipse debugger, CRUD Wizard, using Snippets and about using the available plug-ins with CFEclipse that makes the ColdFusion application development and deployment easy. Chennai ColdFusion User Group is giving Free ColdFusion training for Students. This Training is intended to encourage the students to learn the basics of ColdFusion to build compelling Rich Internet Applications (RIA) using Adobe ColdFusion 8.